Scientists have developed a new 3D printing technology that could be a great help to the space industry. In late February 2015, scientists at the Skolkovo Institute of Science and Technology (Skoltech) in Moscow developed a new printing technology that produces three-dimensional items made of composite materials – carbon fiber to be specific. They also built a prototype for Russia's first composite printer, which is superior to its global competitors in both price and quality. According to the scientists, it will take 5-7 years before this technology can create parts for drones, robots or satellites on a 3D printer. However, a consumer version of the printer for phone covers and other items should be functional in the near future. International companies have already shown interest in the technology. Skoltech told RBTH that they are in talks with Samsung. Skoltech's contribution is its original extruder (machine to soften plastics), which it has designed and manufactured. A simple 3D printer, whether Russian or foreign, can be used as a platform. A preliminary estimate of the Russian printer’s price is 100,000-200,000 rubles ($1,600-$3,200). 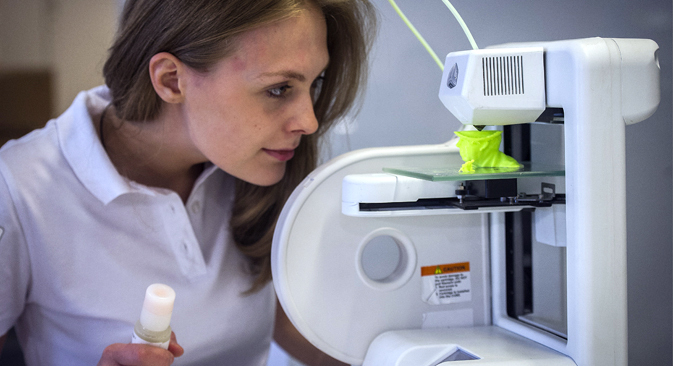 "Unlike competitors, our technology allows us to use any plastic, not just the one that is supplied by the printer's developer," Fyodor Antonov, a researcher at the Skoltech's Center on Prospective Constructions, Processes and Materials, told RBTH. In order to function, the plastic should be mixed in an extruder before printing with a specially prepared carbon fiber, another feature of the Russian technology. According to the scientists, their competitors use unprepared dry fiber. "They use it to make plastic filament and print with this filament," Antonov says. Specimens made using the new Russian technology have a tensile strength of almost two times higher than those of its competitors at 550 MPa (megapascals). Skoltech’s scientists are currently trying to solve another unconventional task as 3D printing is now done in layers. "Our task is to make the fibers to be laid not just layer upon layer, but also 'up,' across the layers, increasing strength in the transverse direction, in order to achieve the real 3D effect," Antonov says. According to the scientists, it is especially important and promising for aerospace parts manufacturing. To achieve the real effect of 3D printing, the developers plan to use an industrial robot with an articulated arm. "So far we use the printer to print flat parts such as rings, circles, rectangular perimeters with rounded edges, gauze elements and samples for testing mechanical properties likes plates and strips,” Antonov told RBTH. “In the near future, we will start printing three-layer reinforced panels." The United Rocket and Space Corporation (URSC) has become a project partner. According to Antonov, the plan is that the URSC will use the printer to create composite sandwich panels for satellites. These are sometimes called "honeycomb" panels, because aluminum honeycomb are used in such panels. "With our technology, the honeycomb structure can be replaced by an arbitrary aggregate, optimal for a given construction," Antonov said. Will Russia become a technological leader in 30 years? According to scientists the technology has two avenues of development: for the space industry and the mass market. "Space is a long-term path," Antonov said. "It is necessary to get the most out of technology, to increase the volume fraction of fibers, to transfer to high-temperature plastic and high-modulus carbon fibers. A larger size is required, as well as precise manufacturing." It is much easier, the scientist noted, to create a small "home" printer with a low fiber volume content. Such a product may be ready for the market in as little as 1-2 years. Among other tasks, it will be able to print a cover for the iPhone. How to create a 3D world?